We’ve just managed to chalk up 1700 km on dirt roads and almost made it back from Cameron Corner intact. I say almost because we lost our wire cage, which housed the spare tyre on the roof, when we were going over a dry creek bed. The boulders were quite big and when the back of the car flicked out the bolts shirred off and were nowhere to be found. Luckily the tyre and the cage fitted into the back of the car and we continued on our merry way. 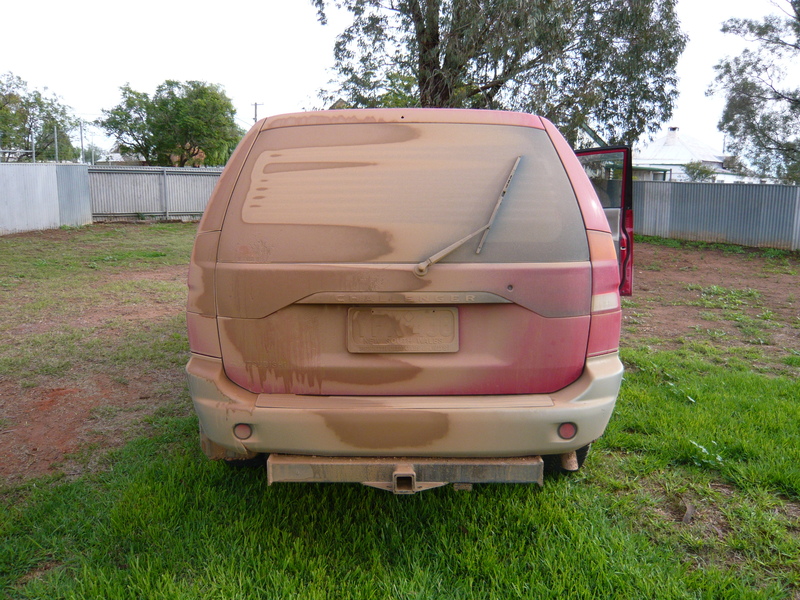 The only other mishap was unexpected rain, which meant that we slid the last 20 kms of our trip back home. Staying in PJ’s underground Bed & Breakfast at White Cliffs. White Cliffs was Australia’s first commercially viable opal field and because of the heat, a lot of residents live underground, where the temperature changes very little all year. Above the ground, you’d be forgiven for thinking that it was a bombing practice range with holes (mine shaft entrances) dug out and then abandoned. It seems that everyone has a mine shaft and PJ’s was no exception. You simply walked down the hallway, past the bedrooms, opened a door and there it was – complete with subterranean levels, ladders and electric lights strung along the walkways. Apparently the clay is quite safe and very easy to work with and, if you have your own excavator, adding rooms is just a matter of digging them out…. provided you don’t run into the neighbour’s house! Drinks with the staff at the Milparinka hotel where we were staying the night was quite an experience – cpmplete with baby lamb (pet) and yabbies (food). Milparinka is one of only two towns surviving in the Corner Country (the other being Tibooburra), which sprang up when gold was discovered in the 1870s. It originally consisted of four hotels, a bank, shops, a library, a newspaper office, police station and courthouse, a Cobb and Co office, school, post office and more. Gold was never found at Milparinka but water was and the township developed along the waterhole in the Evelyn Creek. Today Milparinka is a bit of a ghost town but the local community has restored the courthouse, police station, gaol cells and kitchen, which are now heritage listed. Meeting Tibooburra’s only cop – Jonno – and spending a couple of hours ‘talking shop’. 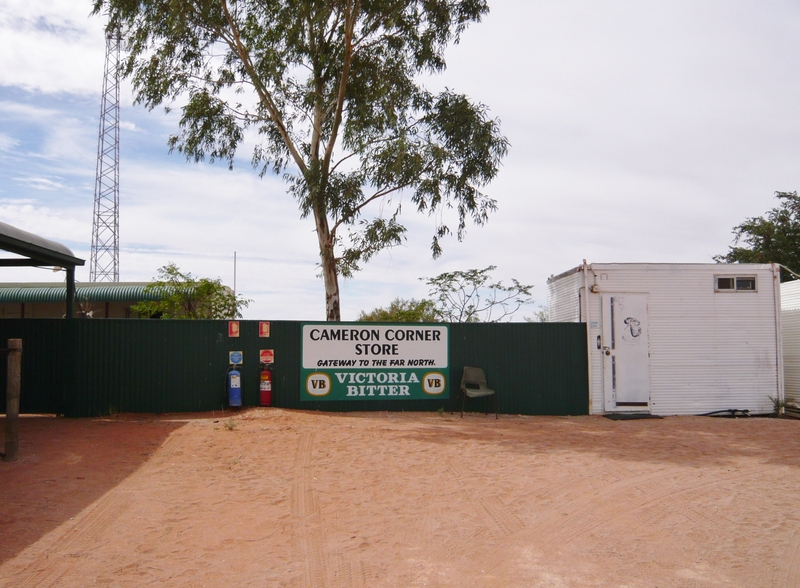 Watching a plane land at Cameron Corner (think Rabbit Proof Fence) and then drive along the road to the General Store for supplies – as you do in the bush. Making it to the top of the hill in Broken Hill to see the Living Desert sculptures (without collapsing half way up) and visiting Silverton (Home of Mad Max). PS a big Thankyou to Lee, Col, Val and Ken who took on the job of babysitting the Bear while we were away.